County spokesman James McConnell confirmed to The Associated Press that officials believe the tree fell because of the rain and wind from the storm’s remnants. Flash flood watches have been posted in parts of southern West Virginia as the remnants of Hurricane Florence fall on saturated ground. The National Weather Service has issued the watch through Monday evening in Greenbrier, Mercer, Monroe and Summers counties. The weather service says 2 to 4 inches (5 to 10 centimeters) of rain are expected in the watch area with 5 inches (12.7 centimeters) or more possible in parts of the Greenbrier Valley. A flood warning has been posted in Virginia along the New River, which flows north into West Virginia. In June 2016, 9 inches of rain fell in 36 hours in parts of West Virginia, leaving 23 dead statewide and destroying thousands of homes, businesses and infrastructure. Fifteen people died in Greenbrier County alone. A dam overflowed and parks have become submerged in water as unrelenting rain brought by Tropical Depression Florence came down on Fayetteville, North Carolina, and the surrounding area. 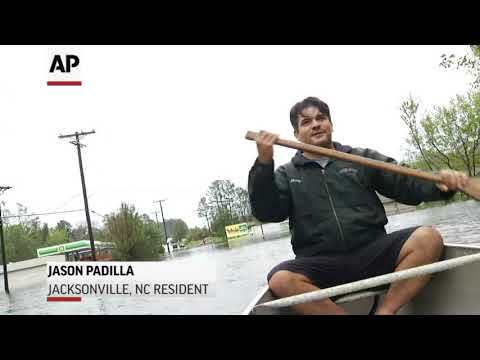 Water on the Cape Fear River, which passes through Fayetteville, continued to rise Sunday, and according to the National Weather Service had reached more than 44 feet (13 meters) by 6 p.m. The river continues its slow climb to a predicted crest at 62 feet (18.9 meters) Tuesday, prompting a mandatory evacuation for areas within 1 mile of the river. Just south of Fayetteville, water spilled over the top of the recently constructed Hope Mills Dam, which blocks Rockfish Creek, a tributary of the Cape Fear River. Fayetteville resident Charles Jockers says the slow rise may lull people into complacency. He says Despite the evacuation order, in-town traffic has been increasing over the last few days. North Carolina’s chief lawyer says he’s looking into accusations that retailers are bilking customers through exorbitant prices as Hurricane Florence and the storm’s remnants have crossed the state. The driver’s name wasn’t immediately released. Flood waters fueled by Florence’s heavy rains have submerged instruments used by the federal government to monitor river levels in North Carolina, causing at least two of them to stop working. The National Hurricane Center says Florence is moving north at 14 mph (22 kph) — a brisk pace compared to its sluggish crawl across the region since Thursday, when it barely topped speeds at which most humans can walk. Florence’s top sustained wind speeds held at 35 mph (55 kph). By 5 p.m. Sunday, Florence was centered about 25 miles (40 kilometers) south-southeast of Greenville, South Carolina, and about 60 miles south-southeast of Asheville, North Carolina. The North Carolina Department of Transportation posted a map online of what it acknowledged was an “extremely long detour” through Tennessee and Georgia for travelers heading south on Interstate 95. It also warned that GPS systems are routing users into areas the department doesn’t recommend for travel. The Smiths packed some spare clothes and medications before getting into a rescue boat. They didn’t have to go far. Firefighters dropped them off at the neighboring home of a relative that remained on dry ground. Duke Energy says the collapse of a coal ash landfill at a closed power station near the North Carolina coast is an “ongoing situation,” with an unknown amount of potentially contaminated storm water flowing into a nearby lake. Duke spokeswoman Paige Sheehan said Sunday that a full assessment of how much ash escaped at the Sutton Power Station outside Wilmington can’t occur until it stops raining. She said there was no indication that contamination from Sutton Lake had drained into the nearby Cape Fear River. Officials in southwest Virginia are urging residents to evacuate ahead of potentially “life-threatening” flash flooding. The National Weather Service has declared a flash-flood emergency for part of the county that is home to North Carolina’s biggest city. Gov. Henry McMaster told reporters on Sunday that it will be days until the cresting of rivers in the area of most concern, along the state’s border with North Carolina. The White House says Trump was also briefed Sunday on the storm’s aftermath by Homeland Security Secretary Kirstjen Nielsen, Coast Guard Commandant Karl Schultz and Brock Long, administrator of the Federal Emergency Management Agency. A small town in northeast South Carolina is getting flooding rains from what’s left of Florence. Kershaw County Coroner David West says the driver’s name has not been released because all relatives have not yet been notified. Some officials rely on the “Waffle House index” to determine how serious a storm is. If the Waffle House is closed, the storm is really, really bad. But as of Sunday afternoon, the shop still had its lights on and was open for business — even as others nearby were boarded up and had sandbags piled in front of their doors. Meanwhile, long lines were forming at gas stations Sunday as a persistent rain fell. Many of the city’s stations are out of fuel. Debbie Randolph says she and her husband called one station that said they had 5,000 gallons (19,000 liters) — and 60 people waiting to fill up. The state’s transportation secretary says 171 primary roads are closed, 100 more than a day earlier. Officials warned that problems would spread westward Sunday along with the remnants of the storm. Gov. Roy Cooper says the storm has “never been more dangerous” than it is now for areas extending from Fayetteville and Lumberton, across the Sandhills, to the central part of the state and into the mountains. North Carolina’s transportation secretary says one of his top priorities is to find a way to get into Wilmington after damage from Florence closed major roads into the city. Columbus County Manager Mike Stephens said late Sunday morning that rivers and streams have been rising due to large amounts of rain from Florence and power is out in a large swath of the county. Stephens says the county’s secondary roads are “almost impassable” and water is covering part of one main highway, U.S. 74. Schultz has a lead role in responding to Florence. He notes that the storm is moving very slowly and that some of the affected areas haven’t seen the worst of it. Warner says a complete dam failure is not expected. So far, she says the lake hasn’t overflowed its banks. Mayor Dana Outlaw told NBC’s “Meet the Press” on Sunday that many of the creeks in the area are “increasing by the hour” and there’s concern about trees falling due to the saturated ground conditions. Outlaw says officials are “urging residents to stay inside and to not travel,” especially so as to not interrupt utility workers trying to restore power. The head of the U.S. government’s disaster relief agency says Florence is unfortunately delivering the damage that was predicted as it sweeps across the Carolinas. Long says the agency’s immediate focus is on search-and-rescue efforts and meeting the needs of people who are in shelters.